Pretty interesting...I had never read any other histories of the Irish Famine, so maybe other arguments might temper my admiration for Nally's work. But this is well done. Nally argues (this is apparently a common argument these days - see Davis, Late Victorian Holocausts) that famines are political, not natural. The 19th century British would have you believe that the deaths caused by the potato famine were simply an act of God and that's that. After all, it's the POTATO famine. No potatoes = famine. But Nally argues that what actually happened was that the British government saw the growing crisis as an opportunity to modernize Ireland. The Irish were seen as a backward people, who needed to be dragged into the modern age, and basically forced to be rationally farming food producers for Britain. If lots of Irish died of hunger, well, that's what you get for the subsistence farming of potatoes. As one British economist wrote: "Hunger and cold are the punishments by which she [nature] represses improvidence and sloth." So the famine, along with a laissez faire response to the famine, would be "an instrument of cure" that would regenerate Ireland. Small farmers would emigrate or otherwise disappear, and Ireland would enter the modern age. One problem I had with this book was that Nally chooses to illustrate it with drawings from period newspapers that are clearly propagandic. Not that what happened in Ireland wasn't awful, but Nally is treating these drawings like they are photographs and can simply illustrate what he is writing about. It seems pretty clear that the Illustrated London News, where almost all of them come from, was using these drawings to try to build sympathy for the Irish and attack British policy. Again, I'm not saying that is inappropriate, but Nally should acknowledge that these images are pretty partisan. These are not the only available images of Ireland. Also, he devotes a whole chapter to a couple of visits to Ireland by Thomas Carlyle, and Carlyle is supposed to basically stand in for British attitudes in general I think. Which is not really fair. Still a thought-provoking book. 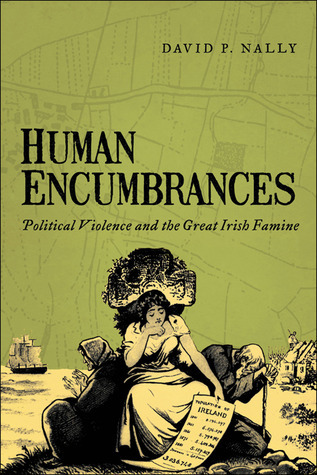 Reading Human Encumbrances today makes one understand how famine isused as a political weapon, shedding new light on current debates aboutthe famine in Somalia and Eastern Africa. Many of the quotes andfigures bring to light this horrible tragedy. I didn't know, forexample, that priests played important political roles in critcizingthe British Empire in its racialization of the Irish. Nor did I knowthat beef and whiskey continued to be exported when the grain neededto support that export economy could have gone to feed people.Rigorously researched, Nally's work does not stray to either anationalist reading of the famine as genocide or a British apologeticreading as 'it was nature's fault'. A must read.